Many users like to set a signature to be automatically included in their outbound emails, and for those who like to have a stylized and somewhat interactive email signature, they’ll want to create what’s called an HTML signature. An HTML signature allows for different text styling like bolds, italics, font sizes, and, perhaps most relevant to many, the inclusion of things like a phone number or links to websites and social addresses. 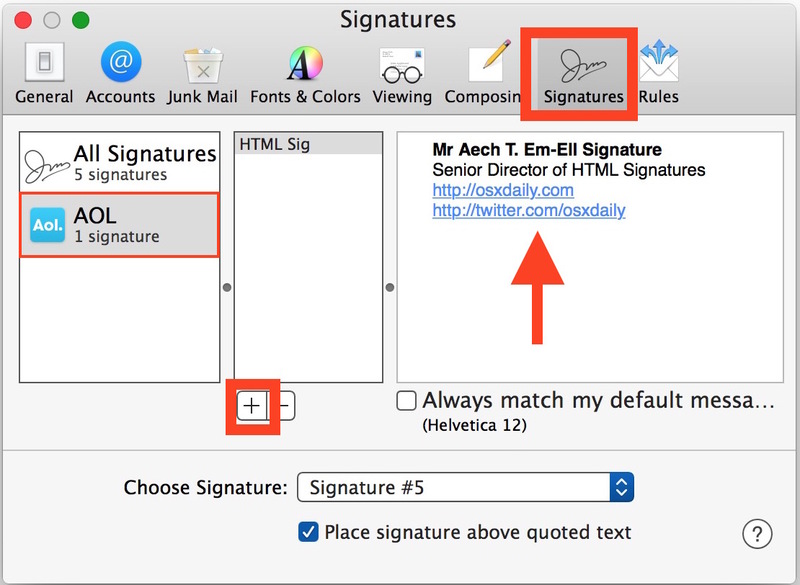 For Mac users who would like to create and set an HTML signature, the process is really quite simple in the Mail app of Mac OS. You can actually create however many signatures you want, and even set different signatures for different email accounts. 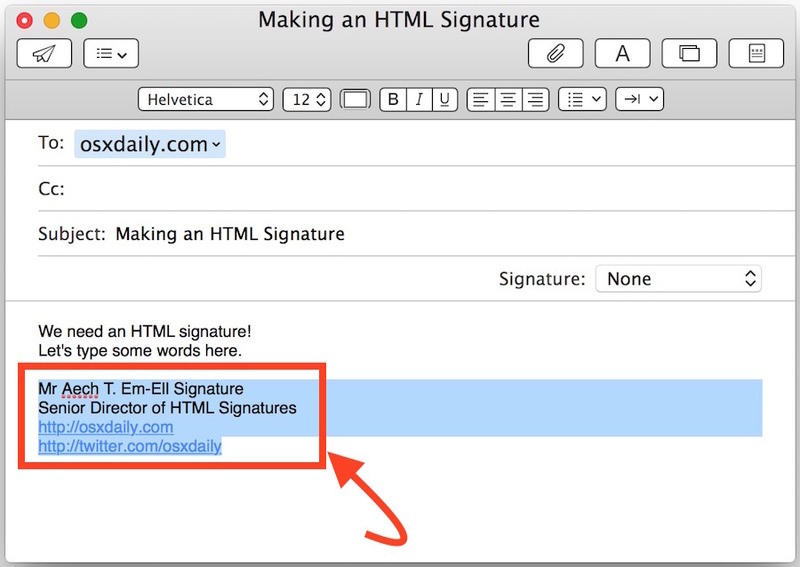 We’ll walk through how to make and set a simple HTML signature in Mail on the Mac. 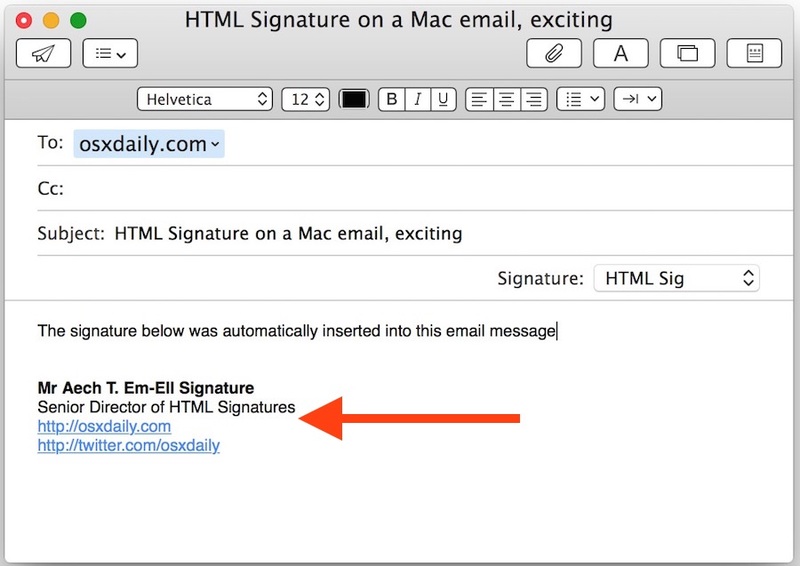 The chosen HTML signature will now appear in every new email message that is created or replied to from that Mac, unless specified otherwise. If you create multiple signatures, you’ll find them available to access and use independently through the “Signature” dropdown menu alongside the Subject field of a mail message. You can create as many signatures as you want, and you can also create different signatures for different email accounts, the latter of which is particularly good idea if you have multiple email accounts set up on a Mac and you want to keep a personal signature separate from a work signature, for example. Some desktop users also may find the brevity signatures pretending to be an iPhone to be useful, particularly if you’re wrangling many emails on a regular basis (and aren’t we all?). By the way, now that you’ve created an HTML signature in the Mac Mail app, you can easily transfer and set the HTML signature on the iPhone or iPad too by simply emailing yourself, copying the signature, and pasting it into the appropriate Mail Signature preference section. Do note that setting custom signatures on the iPhone and iPad will replace the default “Sent from my iPhone” signature that appears on emails sent from your mobile device, unless you specifically add that to the signature itself. This will insert the HTML link into the signature. Basic formatting works as well, like bold, italics, etc. All of this is hidden from plain view though, which makes Mail for Mac OS more confusing than perhaps it should be when building rich professional signatures in the OS X Mail application. I’ve always been surprised that Mac Mail didn’t include an obvious tool like Outlook does to create rich text HTML signatures in OS X. Yes it is easy to paste a rich signature into the field, but it doesn’t have obvious edit buttons and so forth. Thanks for the tutorial, this is helpful for making professional email signatures on the Mac. Would like to be able to add our company logo to an email signature as you can in Outlook. You can insert a graphic and cut and paste like the example above, works great! Is there a way to actually use a persons signature, perhaps as an image, as part of the signature that is attached to the email, and will display correctly in the receivers email vs showing a broken image tag? I’d like to add to my signature a simple small, jpeg image. Sorry, didn’t see this before I made my post. I would like to be able to do this too. Any helpful advice from anyone? Please don’t add images to your email signature. Nobody cares about that crap. Keep it as concise as possible. You wouldn’t want to place video into an HTML signature, since it would be slow to load for mail recipients. You could technically use embed code from YouTube or similar, but again that doesn’t really belong in an HTML signature for emails. Great Mac app to record video of the screen? QuickTime! Yes, you can record the Mac screen with QuickTime Player in OS X, bundled with all versions of the operating system. You can choose to take audio from microphone, or no audio at all. Additionally, you can strip audio tracks from movies in iMovie or with QuickTime to create a mute video after the fact. I would again suggest keeping HTML email signatures simple however, for the best experience for all involved in an email chain. Is there any way to include an image in an iOS signature? I tried copying a signature with an image and it worked once, but the image is no longer there at this point. Is there some trick to getting this to work? I hate to point out the obvious (but I guess it isn’t obvious), but this is NOT how you make HTML email signatures in Mail app. All you’ve shown here is Rich Text – and there’s a big difference. Making a true HTML signature with clickable image links, etc. is a lot more complicated than this.